When you select the Line tool, its properties and options appear in the Tool Properties view. There are a few less options available when working on a bitmap layer. 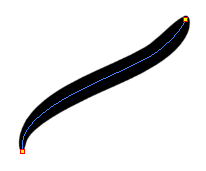 NOTETo learn how to use the Line tool, see About Shape Tools. When enabled, your brush strokes will appear behind the existing artwork. Note that they will appear over your artwork while drawing your stroke, until you release the brush. As you draw in the Line Art layer, the Automatically Create Colour Art option instantly creates the corresponding strokes in the Colour Art layer. NOTE This mode only works with pencil lines or the line tool. The Use Stored Colour Gradient option can be used when painting with a gradient colour to always position the gradient in the same way it was stored, making it consistent across brush strokes. You can store a gradient by selecting a zone painted with a gradient with the Select tool, then clicking on Store Colour Gradient in the Tool Properties view. Draw Circle Enable this option to draw perfect circle (ratio 1:1) without holding any keyboard shortcuts. As an alternative, you can hold down the Shift key. The Size and Smoothness tab allows you to select your pencil's size, its smoothing parameters as well as the shape of its tips and corners. 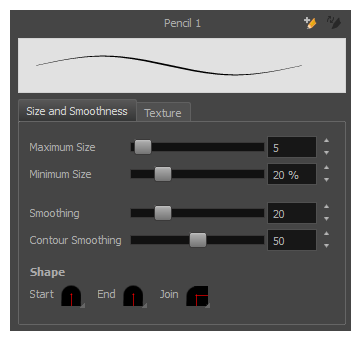 In the Pencil Properties view, the Texture tab allows you to select a pencil texture from the currently selected pencil texture palette to use with the Pencil tool. You can also add, remove or rename textures, save the current pencil texture palette as the default one, or import the pencil texture palette into your scene. 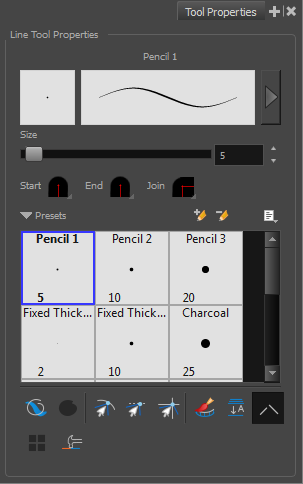 The pencil texture palette used in the Texture tab of the Pencil Properties dialog is the one selected in the Colour view. You can select a pencil texture palette by selecting it from the pencil texture palette list in the Colour view—see Colour View. 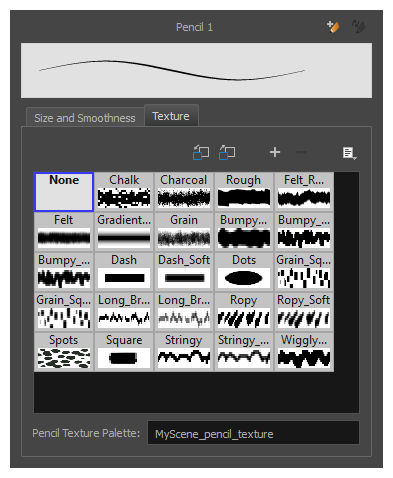 Sets the currently selected pencil texture palette as the default pencil texture palette in your user preferences. 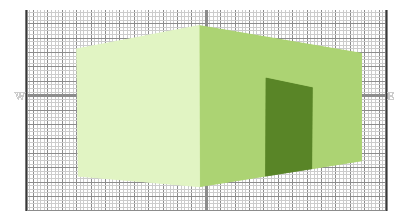 The default pencil texture palette is added to every scene you create in Harmony. The palette is copied in your preferences, so it will be added to your new scenes in the exact state it is when you make it the default pencil texture palette. Imports the default pencil texture palette as a new pencil texture palette into your scene's palette list, and selects it as the current pencil texture palette. Allows you to import an image file into a new pencil texture swatch in the current pencil texture palette. The pencil texture's effect on your pencil line will be based on the image's transparency channel, and will follow your pencil lines on its horizontal axis. Delete Texture Deletes a pencil texture swatch from the current pencil texture palette. Rename Texture Renames the selected pencil texture swatch in the current pencil texture palette. Displays the pencil textures in the current pencil texture palette and allows you to select one to use with the Pencil tool. Pencil Texture Palette Displays the name of the currently selectedpencil texture palette, for reference. To select a different pencil texture palette, you must select it in the Colour view—see Colour View.